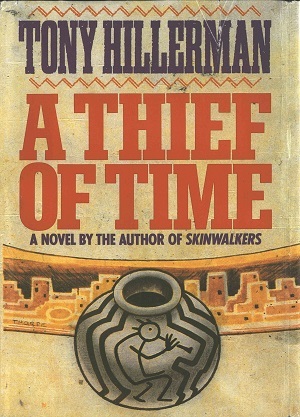 This is the large print edition of A Thief of Time, which is Tony Hillerman's eighth Navajo Mystery novel. This edition was published by G.K. Hall &Co. in Boston, Massachusetts. The cover art was designed by Peter Thorpe and is the same art as the first edition of A Thief of Time. Format: Hardback, 24.3 x 16.5 cm. Binding: Tan boards with a cream colored cloth spine. Large print, the title, the author, and the publisher is printed vertically in purple on the spine.